My attempt at making my home track, Penn Can Speedway. It weekly runs Sail Panel Modifieds, Sportsman,and Late Models. I am using BTB and currently have the track surface done along with the walls surrounding the track. I plan on getting more done at the end of the race season when I will have time to learn more about doing it right. I will release a beta with the track "as-is" soon to get feedback on the track shape/characteristics. Feel free to leave comments. Hello. Is there any not so difficult stuff that I or anyone could help you with?? Hey is this still in the works. 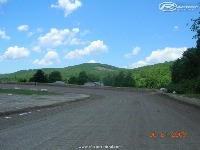 This my hometown track and would love to see it completed. If I could help ya bata test it at any point let me know. Looking great 150 how is it coming? would def love to see this track and five mile point excellent idea...how about rolling wheels too? Im looking forward to this one! My brother used to race here a lot! I would love to see some more tracks from around this region....ie: 5 mile point!!! !